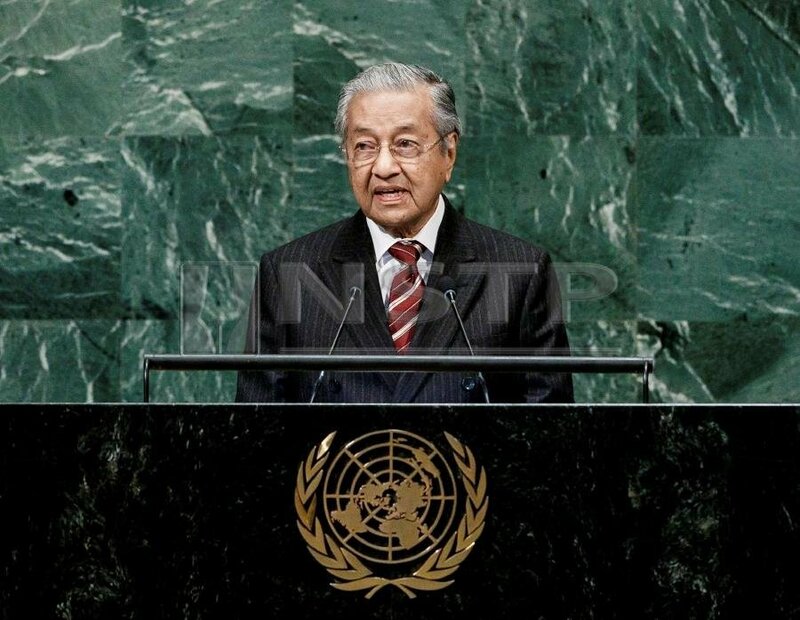 What’s new in Dr.Mahathir’s UNGA 2018 Speech? COMMENT | Sharp as he was and is, Prime Minister Dr. Mahathir Mohamad rattled off his speech to the international community at 11.40am EST in a shaky voice, befitting a 93-year-old man’s cranking of the vocal cords. He spoke with a slight Kedah Malay twang, at times swallowing his words and mispronouncing a few. Perhaps the long trip to New York, jet lag, and age itself contributed to an unsmooth and forceless start. Behind the light golden frame of his glasses, his eyes look puffed, and heavy with bags. He looked tired and groggy. But he was making his comeback, and the global community to know it. Five minutes into the speech, he went right into trumpeting the idea of a ‘new Malaysia’, a slogan more and more now picked up by many Malaysians in their emails and WhatsApp messages – replacing the old “Salam 1Malaysia” which recalls 1MDB, now synonymous with the mysterious and puzzling grand theft of the nation’s coffers, the people’s savings, by Malaysia’s crime ministers and their merry band of more than thieves, including those in turbans and green robes. So, the grand old man – a veritable GOP of one, or the Vito Corleone of Malaysian politics – spoke at length about the new regime’s commitment to ensuring the country’s equitable share of the nation’s wealth. “My last speech here was in 2003, and fifteen years later, the world has not changed much. In fact, it is worse now,” he lamented. Against the jade-green UN General Assembly wall, he spoke of Malaysia’s foreign policy of “prosper thy neighbour.” He spoke with a heightened tone of how in May he overthrew race and religious bigotry to destroy the dominant 60-old party he led for 22-years, at a time when there was still no term limit. A time of consolidation of power, inspired by what Niccolò Machiavelli taught to the prince. Seize power, consolidate power, and disperse it as hegemony, That is the lesson on the deep state of things. Love thy self, know thy enemies, one hundred battles, one hundred victories. The New Malaysia is faced with the global issues of the effects of the US-China trade war, an attack to the institution of marriage, and the war on terrorism, he complained to the assembly. But it was, in general, a good speech. Vintage Mahathir. Anti-imperialist, anti-hegemony, anti-oppression, and anti-US, primarily. I did not expect anything different in content, delivery and tonality from the Prime Minister. He sounded as defiant as David throwing stones at Goliath or Hang Nadim warding off the swordfish with just a keris, as he did during the time of Fidel Castro, Yasser Arafat, Shimon Perez, George Bush, Bill Clinton, and Robert Mugabe – his peers in the general assembly, not all of whom lasted as long as he has. This defiance is how Malaysia’s foreign policy was crafted and communicated to a world that continues to prioritise bombs over bread. I used to like it when Mahathir spoke to the world. He, for lack of a better cliché, called a spade a spade. I just didn’t like what he did to the country in his 22 years of ‘solopreneurial’-political rule. While calling for world justice, he did several degrees of harm to the country’s economic, political, and educational culture, and ensured that almost all power is concentrated in the executive. It is a Bismarckian world the current president of the US would uphold, what with the “principled realism” undergirding the country’s foreign policy – a realism based on the might of the right, and the Pentagonian power of war-loving corporate America of defence contractors, bomb makers, Lockheed-Martin, Boeing, DuPont, and Raytheon; builders of warmongering tools of peace; speakers of the language of the war system, realpolitik and gunboat diplomacy. Thank you, Mahathir, for pointing that out. As the Malaysian ‘comeback kid’ left the podium, teleprompter and all, I did not feel anything except a sense of academic nostalgia – of ploughing through hundreds of pages of his speeches of the 1980s, as he spoke of world peace. Same tone same message, perhaps taken from old files, but whose contents still work fine. Because the world is still the same. Sane and insane. Whether in the global arena, or at home, in Mahathir’s Malaysia. AZLY RAHMAN is an educator, academic, international columnist, and author of seven books. He grew up in Johor Bahru, and holds a Columbia University doctorate in international education development and Master’s degrees in five areas: education, international affairs, peace studies communication, and creative writing. Posted in Diplomacy, Foreign Polciy, Foreign Policy, Freedom, Genocide, Human Rights, Leadership, Malaysiakini, Multilateralism, Rohingya Refugee Crisis, Rule of Law, Tun Dr. Mahathir Mohamad, UNGA, United Nations. Drawing fairly from all PH component parties, Dr Mahathir Mohamad must appoint young MPs as ministers and allow them, instead of retired insiders, to chair the reform panels. I think all component parties of Pakatan Harapan (PH) must face reality. They mustn’t curry favour with each other and pretend nothing has happened. It is better for each component party to state exactly its anxiety and unhappiness so that everyone is clear with each other. If we allow unhappiness to fester, the coalition may suffer fissures earlier rather than later. As a citizen wanting real reforms and good governance for this country, this is my take on PH now. Whether we like it or not, there is a perception of uneven power distribution among the component parties within PH. We accept that Dr Mahathir Mohamad played a vital role in the 14th general election, but we cannot ignore the fact that the bulk of the work was actually done by the young turks of DAP and PKR who suffered persecution in the past and civil society. 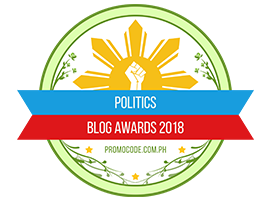 PH’s victory was actually more than 10 years in the making, not just the last two years. With that in mind, I think PPBM and Amanah have been more than adequately compensated. With Mahathir as Prime Minister and so many state MBs under PPBM, I think it is time to appoint the young and the dynamic from DAP and PKR to their rightful places in the Cabinet and other positions, including the Speaker of the House (Dewan Rakyat). I believe fairness is the best way to keep all the parties united. Fairness is good to keep the different parties on an even keel and to provide built-in checks and balances. When one party dominates, others may feel resentful. I see a general reluctance to give room for the young to effect genuine reforms that the country badly needs. I see that important and pertinent ministries and positions are still being controlled by “insiders” rather than reformers. In this regard, may I know why the reinvestigation of Teoh Beng Hock’s death was announced by DAP ministers and not the Home Minister? What is the reason for this? We must recognise that Mahathir can only do so much. Beyond that, he must seek consultation and advice from others. Mahathir needs capable and dynamic MPs appointed as ministers and deputy ministers to assist and advise him. I think it is not difficult for any ordinary Malaysian to spot these capable MPs and assemblymen. In a similar vein, all the reform panels and committees should be led by capable MPs and assemblymen instead of retired insiders and former government officials. If they are so reform-minded, Malaysia would not have gotten into such a big hole in the first place. Elders with substantive experience can play advisory roles but certainly not calling the shots. We must give the newly elected MPs and assemblymen the opportunity to decide how they want to move this country forward. Why elect new MPs and assemblymen when we are going to use the same old people to reform our country? There will be pent-up frustration if the energy of these young MPs and assemblymen is not harnessed. I believe they are in a better position to suggest and provide recommendations to the government. This country needs a reboot, not tinkering. The views expressed by the writer do not necessarily reflect those of FMT. Posted in Defence-Security, Democracy, Dr. Wan Azizah Ismail, Foreign Polciy, FreeMalaysiaToday, GE-14 Malaysian General Election, Governance, Leadership, Malaysia, Meritocracy and Competence, Pakatan Harapan, Parti Pribumi Bersatu Malaysia, Politics, Public Management, Rule of Law, The Malays, Tun Dr. Mahathir Mohamad, UMNO. Posted in Democracy, Development Diplomacy and Soft Power, Diplomacy, Donald J Trump, Fareed Zakaria, Foreign Polciy, Foriegn Affairs, Leadership, Trumpianism. In a year that had its fair share of symbolic moments, Prime Minister Datuk Seri Najib Razak took home a fistful of trophies. One prize was his cameo meeting in September with US President Donald Trump at the White House, which counts as a juicy political point for the coming general election. Najib brought “strong value propositions” for Trump in the form of a multi-billion dollar commitment to buy Boeing jets, an offer to push AirAsia to buy General Electric engines and a pledge to increase investments in American infrastructure. With this gesture “to strengthen the US economy”, the premier secured numerous pay-offs, including blunting the barbs of his critics on the US Justice Department’s investigation into the troubled state investment fund 1Malaysia Development Bhd. Though there was some collateral damage from the trip, the net gain from an electoral viewpoint would be in the PM’s favour, although Najib did remark that his comments on helping the US were misconstrued. The tacit endorsement which Najib has earned from his meeting with the US leader would play well in rural electioneering, especially since his Washington trip was followed immediately by another photo op with British premier Theresa May. On the home turf, Najib raised his score as the commander-in-chief of the ruling Barisan Nasional coalition through a number of moves that served to blindside the opposition parties or at least, put them on the back foot. In early April, the government made the unprecedented move of clearing the parliamentary order paper of its business to make way for a Private Member’s Bill. The next day, PAS President Datuk Seri Abdul Hadi Awang tabled a motion to amend the Syariah Courts (Criminal Jurisdiction) Act 1965, seeking to grant the Syariah Court powers to impose stiffer penalties on all crimes except those with the death sentence. The enhancement of the Syariah Courts’ powers, a prize long sought by PAS but hitherto beyond its parliamentary reach, is the clearest indication to date of the coming together of the Islamist party with Umno in an electoral alliance, despite their long history of political enmity. The shifting alignment only reflects the growing importance of religion as a cement to hold together the fractured Malay voter base. Another aspect of this theme is the hosting of the King Salman Centre for International Peace at the Islamic Science University of Malaysia, following Saudi Arabia’s King Salman Abdulaziz Al Saud’s visit to Malaysia in March. Not only does this move strengthen Najib’s legitimacy as a leader among Muslims, but it also burnishes his credentials as a key ally in the global fight against terrorism. 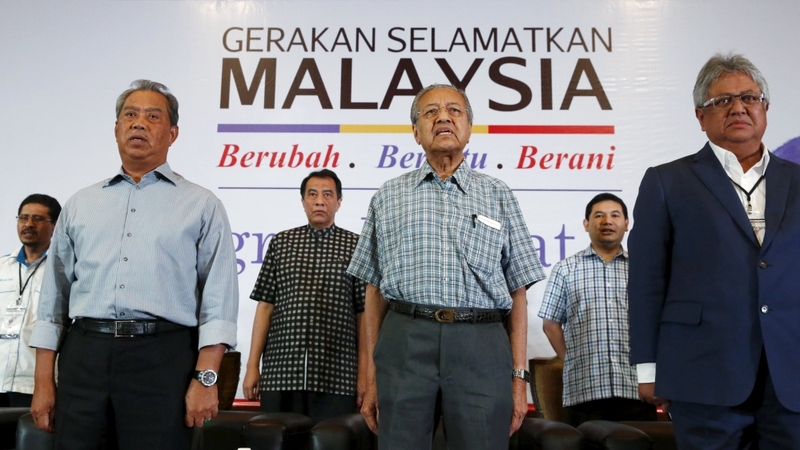 All this would go some way towards mitigating the damage that his one-time mentor turned nemesis, the tenacious former Prime Minister Tun Dr Mahathir Mohamad, has been inflicting on his image since the elder leader joined forces with the opposition parties. Among the list of sins that is being laid at Najib’s feet is the view that he has sold out the country’s strategic interests to obtain a funding lifeline from China. The East Coast Rail Link, among a laundry list of infrastructure projects, has been singled out for particular criticism. The PM’s team has worked hard at fending off these claims, and Najib has retorted that he would never sell Malaysia’s sovereignty. Helping to contain Mahathir’s virulent campaign to unseat Najib, the quick-acting Royal Commission of Inquiry into Bank Negara’s foreign exchange losses in the 1990s has shifted some attention away from his litany against the PM to the debacle that took place under Mahathir’s watch. While the inquiry report is being challenged by Mahathir, it continues to have life enough to give Najib and his team ammunition for their battle with detractors. Even if the electorate were unimpressed by their leaders’ quarrels over past and present scandals, they would likely be motivated by the long list of benefits that Najib announced in his budget for next year. From a reduction in income tax rates to easier hiring of domestic help and discounts on study loan repayments, to name a few, the message that Najib has sought to convey to voters is that his government is listening to their needs. In keeping with this softer touch, Najib paid a courtesy call on de facto Pakatan Harapan leader Datuk Seri Anwar Ibrahim when the jailed opposition leader was in hospital for an operation on his shoulder joint in November. If nothing else, the gesture would sit well with voters who see it as a sympathetic or even magnanimous act by the nation’s leader. That’s a good feeling to ride, going into perhaps the toughest election challenge that the BN has faced in decades. But still, for Najib, the coast is not as clear as he would wish it to be. He has to face the increasing number of voters unhappy with the rising cost of living, the never-ending problems with FELDA and its companies (whose settlements in the Malay heartland form the core support of UMNO and the issue of 1MDB that will not easily fade from the scrutiny of international media. Also, the emergence of new politics in Sabah and Sarawak, for which the political mantra — Sabah for Sabahans and Sarawak for Sarawakians — could sway both sides of the political divide. Posted in 1MDB Financial Scandal, Corruption, Democracy, Donald J Trump, Financial Scandal, Foreign Polciy, GE-14 Malaysian General Election, Governance, Kleptocracy, Leadership, Malaysia-US Relations, Najib Razak, Politics, Religion, Tun Dr. Mahathir Mohamad, UMNO. Development and security issues are interconnected in India’s eastern subregions – the Bay of Bengal, the Himalayas, and the Mekong subregion. Together, these subregions form India’s first geostrategic chain in the wider Indo-Pacific region. A subregion is a small group of geographically adjoining countries sharing a common ecosystem with interconnected development and security spaces. New Delhi’s evolving subregional approach needs to view the three subregions as a single strategic arch. The recent military standoff between India and China in the Himalayas, the winning of strategic port contracts in key littorals of the Bay of Bengal by Chinese companies, Islamabad’s reluctance to be part of regional initiatives and China’s growing regional political clout – as demonstrated by the willingness of most nations in the subregions to join the Chinese ‘Belt and Road Initiative’ – have further complicated India’s subregional policies. Within this challenging environment, India and its smaller neighbors in the subregions have been looking to strengthen alternative subregional institutions such as the Bay of Bengal Initiative for Multi-Sectoral Technical and Economic Cooperation (BIMSTEC), the Bangladesh-Bhutan-India-Nepal (BBIN) Initiative, and the Mekong-Ganga Cooperation (MGC). The renewed focused on these subregional groupings contributes to both India’s domestic and regional governance needs. That New Delhi has been recalibrating its approach toward its subregions is evident through the launching of the “Neighborhood First” policy and the “Act East” policy. However, in the changed geo-political context, traditional compartmentalized views of the subregions are unlikely to provide the fullest benefits to India. India’s eastern subregions play a critical role in advancing two objectives of the Act East policy. Together the subregions provide India with both land and maritime options to access the East, and have emerged as key spaces for New Delhi to push its cross-border connectivity projects. The ongoing trilateral highway project – linking India’s Northeast with Thailand through Myanmar – is one such initiative with plans to further extend it to Laos, Cambodia, and Vietnam in the next phase. As New Delhi strengthens its security engagements with the region, nations in the three subregions are emerging as important partners. In 2011, New Delhi put into practice its subregional approach in defense cooperation when it set up trilateral maritime security cooperation with Sri Lanka and Maldives to enhance maritime security. The idea was later expanded by inviting Mauritius and Seychelles to join the initiative. India has entered into new defense and security agreements and initiated joint patrols and exercises with several nations in the subregions. Recent signings of memoranda of understanding for defense cooperation and offers of extending credit for purchase of arms and ammunition to subregional countries such as Bangladesh, Myanmar, and Vietnam, are indications of New Delhi’s renewed increase of subregional security cooperation. New Delhi’s subregional strategy aims at finding synergies between domestic and external policies, with the goal of advancing its foreign policy interests. Development of its frontier regions is thus a priority, because those regions play a critical role in the effective implementation of the strategy. In this context, India’s Northeast and the Andaman and Nicobar Islands – along with the entire eastern seaboard – are key spaces in pushing forward India’s subregional strategy. Building partnerships with like-minded countries in the development and security of the sub-regions forms another vital element of India’s approach. Unlike the past, when New Delhi was wary of collaborating with external actors in its subregions, India is now willing to leverage its partners where strategic interests converge. The subregions are opening up new opportunities for such collaboration. In this context, a shared vision of an Indo-Pacific region guided by ‘values-based’ and ‘rules-based order’ forms the basis for building partnerships. New Delhi also has been giving greater roles and responsibilities to its states under the principle of cooperative federalism. The emphasis on the states’ role in regional diplomacy is another facet of the subregional approach. In practice, this is a work in progress. For cooperative federalism to support the subregional strategy there is need for effective coordination between the two. There is also need for creating a cadre of subregional specialists in the bureaucracy and a new policy for India bureaucratic services based on geographical zones that are in line with its subregional strategy. The rebuilding of mutual trust with neighbours is another critical feature of India’s subregional approach. At a time when China is a willing partner in these subregions, and the smaller neighbors are seeking to maximize benefits, New Delhi is trying to minimize the mistrust that has long characterized its relations with smaller neighboring countries. One such attempt is by reviewing past bilateral treaties and agreements that are considered ‘unequal’ by smaller neighbors. In 2007, India updated the 1949 friendship treaty with Bhutan and last year a joint mechanism between India and Nepal was set up to update all bilateral treaties and agreements. As India’s global aspirations grow, there is recognition that an unstable neighborhood can guarantee neither economic development, nor security. In this context, India’s vision in its eastern subregions has been to share its economic growth and enhance security cooperation, with the aim to build an ‘interlinked destiny’ of peace and prosperity in the region. India’s eastern subregions are critical in safeguarding the country’s primacy and in expanding its strategic reach. As New Delhi fine tunes its subregional approach, there is need for constant nurturing of the strategy and assessment of its effectiveness in these ever-changing regional dynamics. This revisiting of the strategy should be aimed at injecting it with new dynamism and innovative ideas to keep pace with the changing times. K. Yhome is a Senior Fellow with New Delhi-based Observer Research Foundation (ORF). He can be reached at khriezo@gmail.com. Posted in Asia, China, Defence-Security, Foreign Polciy, Geo-Politics, India, Indian Ocean. *Syed Munir Khasru is Chairman of the Institute for Policy, Advocacy, and Governance (IPAG), an international think tank. The escalating campaign of ethnic cleansing by Myanmar’s military in Rakhine State is threatening to undermine the country’s ongoing democratic transition – and to tarnish irrevocably the reputation of the country’s de facto leader, Daw Aung San Suu Kyi. But she still wields enough moral authority to act. For a Bangladesh already reeling from seasonal flooding, managing the inflow of refugees has proved a momentous challenge. Makeshift camps are overcrowded, lacking in basic resources, and vulnerable to natural disasters; already, a cyclone has destroyed some camps. Other surrounding countries, including India, Thailand, and Malaysia, are also feeling the effects of the Rohingya’s plight. Far from moving to stop this humanitarian crisis, Suu Kyi’s government has exacerbated it. While Suu Kyi does not control the military, which is leading the murderous crackdown, her government has blocked UN agencies from delivering vital emergency supplies. The UN Population Fund (UNFPA), Refugee Agency (UNHCR), and Children’s Fund (UNICEF) have all been forced to halt work in the affected areas. This represents a tragic departure for Suu Kyi, who previously won international acclaim – and a Nobel Peace Prize – for her role in the fight for democracy in Myanmar. The rise to power of her National League for Democracy in 2015 marked the end of 50 years of military rule in the country formerly known as Burma, and seemed to herald a new era, in which the human rights of all inhabitants would be respected and protected. Amid the violence against the Rohingya, faith in Myanmar’s transition from military dictatorship to democracy is rapidly deteriorating. The military, which holds 25% of the seats in parliament, has already blocked Suu Kyi from becoming president, and, along with Myanmar’s nationalists, it continues to constrain her authority. Now, the military is actively persecuting and even murdering members of one of the country’s largest ethnic and religious minority groups, in what the UN High Commissioner for Human Rights, Zeid Ra’ad al-Hussein, has rightly called “a textbook example of ethnic cleansing” – all for political reasons. Buddhist nationalism has lately been gaining traction among many Burmese, fueling hatred and violence toward the Muslim Rohingya. By attacking the Rohingya, the military secures the support of Buddhist monks, who remain influential in Myanmar and could thus challenge the military’s authority. As for Suu Kyi, she is now between a rock and a hard place. If she sides with the Rohingya, she will face a powerful backlash from the military and a large share of voters. But, by remaining silent, she is severely damaging the moral authority that allowed her to wear down Myanmar’s generals and place the country on the path to democracy. Suu Kyi did appoint a commission, led by former UN Secretary-General Kofi Annan, to figure out how to address the divisions between the Rohingya and Buddhists in Rakhine State, where most Rohingya live. But her goal appeared to be simply to buy time, though she probably also hoped that Annan would find a way to resolve her dilemma. What Myanmar needs today is a genuine peace process that recognizes the ethnic and religious components of the Rohingya crisis. Suu Kyi, who was praised by the Nobel Committee in 1991 as “an outstanding example of the power of the powerless,” should be the person to lead such a process. Yes, her power is severely limited, as she has no authority whatsoever over the military. Yet her moral authority, which once proved powerful enough to bend the military to her will, is not entirely depleted. To wield that authority effectively, Suu Kyi must be willing to take a political risk. To be sure, as delicate as the political order is in Myanmar, there is no gridlock that obviates an agenda for progress in achieving peace. But a peace process will require Suu Kyi to stand up to Myanmar’s generals, as she has done in the past, reminding them of the enormous benefits they have reaped from the political transition and convincing them that it is not in their interest to jeopardize the democratization process. Suu Kyi said in her Nobel Peace Prize lecture in 2012, “to be forgotten, is to die a little.” She must not allow the Rohingya to be driven out and forgotten. Her task is to give power to the powerless and bring peace to Myanmar. Posted in ASEAN, civil society issues, Ethnic Cleansing, Foreign Polciy, Myanmar, Politics, Rohingya Refugee Crisis, Security.